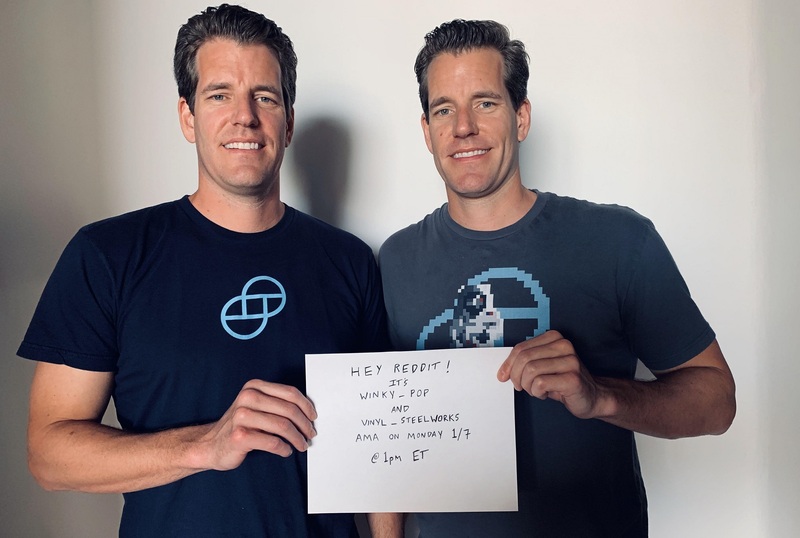 The Winklevoss twins hosted an Ask Me Anything (AMA) on Reddit that covered their efforts with the Gemini Exchange, cryptocurrency in general and other topics. We detail the highlights of the AMA here, though the AMA is well worth reading in full. Users posted several questions to the twins, including some hard-hitting ones, which, to their credit, they answered in plentiful. Questions also touched on personal passions, such as rowing, of which the Twins were famously capable. Bitcoin is certainly the OG crypto! It’s hard to defeat network effects — so in terms of ‘hard money’ (i.e., store of value) Bitcoin is most likely the winner in the long term. Our thesis around bitcoin’s upside remains unchanged. We believe bitcoin is better at being gold than gold. If we’re right, then over time the market cap of bitcoin will surpass the ~7trillion dollar market cap of gold. If you’re so committed to Bitcoin, why hasn’t your exchange implemented the latest Bitcoin technology yet? Things like implementing Segwit and transaction batching would not only benefit both your exchange and your customers but also the network as a whole. Our Bitcoin hot wallet was made before Segwit was but a twinkle in Pieter Wuille’s eye. It would be very tricky to retrofit Segwit into there. So we built a new hot wallet, from the ground up, with support for Segwit, transaction batching, Bech32 addresses, and all sorts of other goodies. We used that new system for Zcash, Litecoin, and Bitcoin Cash, which is why we’re already using both native and P2SH wrapped Segwit for Litecoin. We’re working on migrating Bitcoin to the new system, and it should be done in Q1. What’s your short term plan to gain approval on Crypto ETFs and longer term where do you see STOs? Marketplace Conduct Rules – we implemented this to foster a rules-based marketplace. Marketplace Surveillance – we have have partnered with Nasdaq to implement Nasdaq’s SMARTS Market Surveillance technology to monitor the Gemini marketplace. Market Surveillance Team – we have built an in-house team to monitor out marketplace for manipulative and deceptive practices. Virtual Commodities Association – we are helping stand up an industry-sponsored self-regulatory organization for virtual commodity exchanges. We are committed as ever to making an ETF a reality! The Winklevoss Twins are the minds behind the Gemini Exchange, has also launched the Gemini Dollar, a stablecoin pegged to the US Dollar. The New York-based exchange,proudly advertising that it is a regulated cryptocurrency exchange, as seen in the many advertisements cropping up on Wall Street and other places, has had a stellar 2018, putting it in shape to become one of America’s top cryptocurrency exchanges. We know we aren’t going to please everyone but the healthiest and most vibrant economies have thoughtful rules to promote positive outcomes. You can’t point to a lawless economy that is thriving. To be clear, there are exchanges and custodians that subscribe to our principles and it’s encouraging to see that we are not alone in this regard — but for us this is a core focus and something we have worked hard to be thought-leaders in. The Gemini Exchange currently offers Bitcoin (BTC), Ethereum (ETH), Litecoin (LTC), Bitcoin Cash (BCH) and Zcash (ZEC), though there are plans to offer more tokens in the near future. Trade volume for the exchange currently hovers at around $20 million over 24 hours. I have always been skeptical about things like this, i have never believed posts saying i can make $8,100 in a week when i invest $500 in bitcoin mining/binary option, for me it was just too good to be true,I’ve always thought bitcoin mining/ binary option was a scam until i decided to give it a try, investing $500 first, so that way i know i didn’t lose too much if it doesn’t work out but surprisingly Mr Brooks cleared my doubts by making me earning $8,100 in just a week. I was given access to my trading account, NO EXTRA FEE CHARGED, Withdrawal was directly to my bank account, I sent him commission after I got my profit. scam remember in every rumour there is an element of truth, trust me I’ve gone down that road before and I tell you today that am benefiting, Make a bold decision today by investing in binary option.